Endpoint Security is enabled on managed devices by deploying custom Endpoint Security settings. Endpoint Security can be enabled on managed devices via the initial agent configuration. 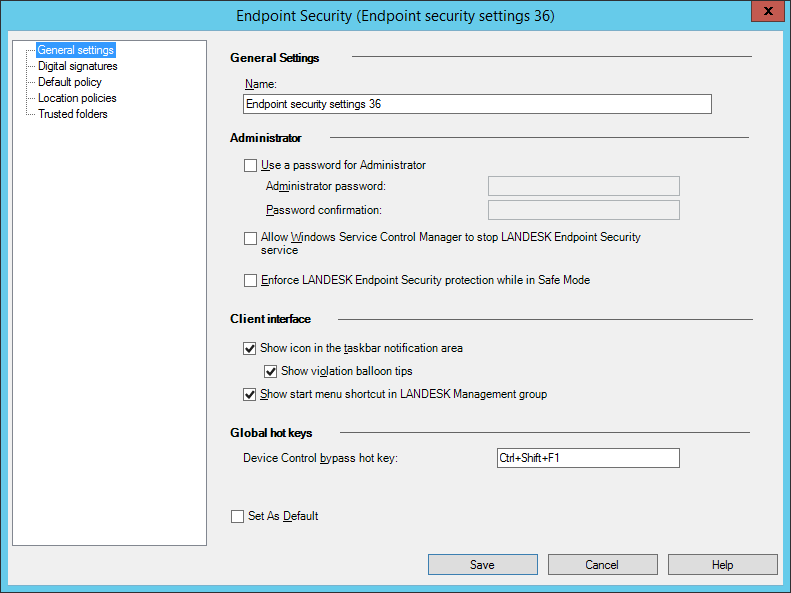 You can also use a change settings task to install or update Endpoint Security settings to target devices. Click Tools > Configuration > Agent Settings. In the Agent Settings tool window, right-click Endpoint Security, and then click New. At the General settings page, enter a name for the settings, and then specify the general requirements and actions. For information about an option, click Help. At the Digital signatures page, configure how signed applications are handled. At the Default policy page, select which Endpoint Security components you want to deploy to target devices with the Endpoint Security settings. At the Location policies page, configure location-aware policies that you want to use. At the Trusted folders page, specify any folders whose contents you want to trust automatically. Once configured, you can deploy settings to target devices with an installation or update task, or a change settings task.